Posted on September 23, 2014 . When you consider the time and money invested in managing an ERP throughout its entire life cycle, it’s no wonder companies do everything they can to extend system longevity. ERP life cycles are intended to span 7-15 years or more. The steps in the life cycle process are complex. Typically, the CIO must lead a process to select the right system, maintain and enhance the system to align processes with changing business goals, and evaluate the system’s effectiveness. From birth to death of your ERP, there are a multitude of issues to keep in mind. 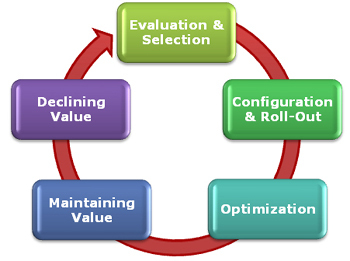 What top priorities must be addressed in each stage of the ERP life cycle? Need help with ERP planning, selection, implementation, training or best practices? Contact us today to learn how we can help. As enterprise systems are considerable investments, they are worth the effort of a comprehensive Request for Proposals (RFP) process. Your RFP should take into consideration both system requirements and the implementation process. Topics should cover what is needed for system security, architecture, reporting, and a thorough breakdown of features for each module you will use. Identify all your requirements for software configuration, transaction processing, process automation and reporting as it pertains to each module. Ask vendors to indicate features that are available through configuration, features that require customization to achieve, and features that are not available in the software. It’s also a good idea to inquire about enhancements planned for future upgrades. Prior to meeting with vendors in live demos, provide narratives of your user stories that represent the differentiating aspects of your business. This brings attention to the aspects of your business that make it unique. Vendors can then walk you through the differentiating processes during the live demo. You will be able to see first-hand what is possible with the software and what is not. It’s also important to assess your implementation consultant’s experiences and background. Does their team have the resources and experience needed to perform the configurations you require? Have they successfully managed ERP projects similar in size to yours? Beware of the presenter who puts on a splashy presentation; you’ll want to base your decision on qualifications and not a jazzy slideshow. Your ERP consultant needs to have a rigorous process that guides your team and helps you to avoid distraction and scope creep. Meet the implementer’s project manager who will be assigned to your project, not just the sales team. Make sure the project manager asks more questions than you do. You need someone who is interested in what your needs are, and who is not just an optimist. It’s a good idea to involve your in-house implementation team in your project from the very beginning. Include on your team a key player from each area of your organization that will use the system. Make sure each department has an opportunity to identify their needs; this information will help to inform topics covered in your RFP. Ask these key players to write the user stories that define differentiation, which you will then include in the vendor demos. Include the implementation team in vendor demos, as they are well-positioned to help judge how closely the software meets company requirements for functionality. Seek your in-house team’s feedback throughout the process. You will create greater buy-in among your staff by involving these key employees early on. Roll-out should include intense audit steps to make sure the system is solid before you try to run your business in it. To stay on-time and on-budget, don’t stray too far from your implementation plan. As requests for new or enhanced functionality come up, develop a wish list for the Optimization period rather than adding it to the existing stage. A good systems integrator will ask the right questions at the start of contract negotiations so as to help you avoid the need for contract adjustments later on. Provide thorough training to your implementation team first. That way when you roll out the new system, you can involve your implementation team as super users. This team will be able to help co-workers with the easier day-to-day questions about system functionality, which takes some burden off the help desk. Help desk staff can then resolve bigger issues more quickly. Make your process transparent to staff. Keep employees in the loop about the timeline, the steps involved, when they will receive training and what resources will be given to them. Providing this transparency will help to alleviate some of the anxiety staff feels about significant changes coming their way. Once you reach the post ERP roll-out stage, you enter a shake-out period where issues and bugs are found and resolved. The change management process continues with more training and with regular employee communications to address any misconceptions about changes to policies and procedures. Consider that it usually takes twice as long for employees to adapt to change as it took for you to plan it. Count on a period of at least six months to a year for employees to feel proficient in using the new system. It’s a good idea to identify what “success” means for your ERP project during or prior to reaching this stage. Rather than success being defined as completing an on-time, on-budget project, success with your new ERP should be defined in terms of the measurable benefits your company receives, as well as what value it brings to your customers, as a result of using the new system. Consider performing a post-implementation audit after using the system for six months. Key stakeholders to include in the audit are your users, IT department, and a selection of customers and vendors, in order to assess the full impact of the new system. Your wish list will likely grow as a result of the feedback you obtain in the audit. Once this audit is completed and your wish list is adjusted, begin to map out a timeline for implementing wish list items. This is the longest stage of the ERP life cycle, lasting anywhere from 6-10 years or more. It is during this stage that the value of your system is realized. Now is when you begin implementing those items on your wish list. But keep in mind that your business isn’t static and your enterprise system plans should not remain static, either. Continue to look for ways to enhance your system and to integrate new tools in order to get the most out of it. Monitor business trends in your marketplace and consider how adjustments to system configuration would add value for your customers. Follow issues and hot topics in the ERP community. If you’ve partnered with a good ERP consultant, you will retain that relationship for years to come. Your consultant will provide additional training and guidance on the safest and best ways to achieve configuration changes. At some point, your company will realize that the system is no longer meeting business needs. Perhaps you are on a version of the software that is no longer supported. Your hardware may be on the decline and, due to the age of the system as a whole, you decide it’s time to reevaluate your needs. You begin to research and explore options. The ERP life cycle repeats. As your company traverses each stage in the life cycle, take a moment to consider the lessons your team has learned. What went well? What do you wish had been handled differently? Document those lessons so you can refer back to them the next time around.